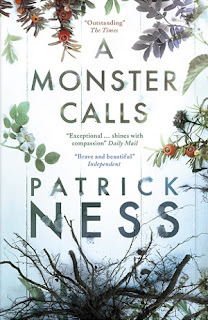 A few months ago, I read and reviewed Patrick Ness' A Monster Calls, a beautifully illustrated young adult novel about a boy dealing with his mother's terminal illness. Some time after that, I received an email from a senior press officer at Walker Books, the publisher behind A Monster Calls. He said that the book is being released in a new edition that specifically targets adults so that they too can be moved by this beautiful story. I am of two minds about this. I love that the book is gaining so much recognition and that the publisher understands that it has a universal appeal. The story is heart-breaking on levels that adults will understand just as much as children, and I strongly believe that the book will offer solace to adults, help them to forgive themselves for any wrongs they may have committed. But the illustrations are really amazing. They capture the spirit of the book so wonderfully, with the black and white pen drawings and this huge, looming monster and the shadows and all the rest. They add so much to the story, really complete it. But apparently, adults aren't interested in illustrated volumes. They think they are too childish. I find this a little hypocritical on the part of adults, mostly because all of them are only too happy to pick up books that are marked young adult and do not have illustrations - Twilight, The Hunger Games, etc., etc. But they decide to draw the line at something illustrated? As though A Monster Calls is more of a children's book than Twilight is. Sigh. People can be so frustrating sometimes. But honestly, if removing the illustrations and making the book an easy-to-carry-sized paperback is what it takes to get this book into more people's hands and to encourage more people to pick the book up, read the first page, and become utterly absorbed in the story, then that's fine with me. Maybe those people will read this version, realize that there is another version with illustrations, and then read that one, too. That would be ideal. I'm interested to know - as an adult, are you less likely to read an illustrated novel than one without illustrations? Do you associate illustrations with a story aimed at a younger audience? I wonder if my enjoyment of graphic novels makes me more disposed to enjoy an illustrated novel than the general public. Whichever edition of this book appeals to you more, I highly recommend you get your hands on it. It's absolutely amazing. Note: I received a copy of this book for free to review. I read a lot of comics, so I'm probably biased. But I'll say that when I see an illustrated version of something, I do assume things about the book. Not that it's childish, but that it's got a dreamy or poetical quality. In general, it seems like there are reasons to add illustrations to specific books, and in my mind they don't have anything to do with being childish, but entirely with what the author is trying to do (create a fairy tale quality) or what the story is meant to evoke (very visual). Oh, that's a good point. I shouldn't assume that people find those books childish, but that the books just possess a different quality that perhaps do not appeal to certain readers. I am a little miffed about this too. The book is at it's most powerful when the illustrations are added in, and they form the crux of the story. I wish that more adults would feel kindly toward graphic novels. It would open up a world of reading for them. I like both types of books. OOH gorgeous cover and I love Patrick Ness so much I can not even believe I have not read this one yet! I would need to read the illustrated version, and I say that as someone who doesn't like graphic novels. But EVERY REVIEW I've seen of this book has mentioned how the pictures add to the story, so what were they thinking taking them out? I wish more novels for adults (and young adults) had illustrations. I love them. I think if adults were given the choice of a book with illustrations and a good message, most would pick that book. But they have to know it's out there. Adults usually don't shop in the children's section for their own reading. If the publisher wanted to interest adults and was really paying attention to the contents then they should maybe make a cover that would appeal to adults and ask for the books to be shelved in BOTH adult and children's sections. I wonder if they even considered it, or went straight for the picture-less adult version. There's a tiny mean part of me that is all, "Boo to these editions! If people are snobbish enough to refuse to pick up a book because it has illustrations, they *deserve* to miss out on great stories!" The same goes for Discworld editions with Grown-Up, Respectable covers instead of the awesome Paul Kidby artwork. But the mature part of me knows that barriers to accessibility are a very real thing - as much as I don't like it, they have a psychological impact on people and you can't just wish them away. So I guess I'm glad editions like this exist, but I do hope they'll encourage people to confront the thought processes that kept them from a good story in the first place, instead of simply providing an excuse to think of this book as an exception. That's a pity, illustrations can be wonderful and there are plenty of them in classic books, printed for adults. Personally it depends on the book and the type of illustration. I'll read any children's book with illustrations regardless of that element, and it depends on the quality of the picture when it's an adult book (not to say it must be fine art, but appealing). 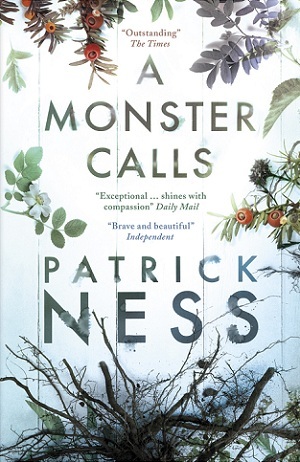 So knowing there are illustrations that enhance the story of A Monster Calls, I'd want to read the original edition. My edition of Great Expectations means I can't associate them only with a younger audience. It's not snobbism for me; I'm just not a visual person. I am indifferent to illustrations, and if there's a volume that's smaller because it doesn't have them, I'll buy it. I like the illustrations so this would be for me. I don't understand this decision at all. Not only do I not believe in marketing books differently for adults vs. children, but especially in this specific case, to remove the images is absolutely... ridiculous. The images are hardly "childish" and add so much to the story. Seeing as I first read the book as an eBook, I didn't even realize how much the images added (only once I bought the beautiful hardcover did I fully appreciate it) - I cannot see any justification for marketing this one any differently. It is indeed sad that a book needs to be "cleaned up" to make it fit for the adult market. This reminds me of the Discworld books & the Harry Potter ones that were repackaged as well. Though those did not contain any illustrations. Frankly speaking, I would prefer more books, geared towards adults or not, to include illustrations! I like illustrations, actually, even though I don't read graphic novels. I wish older YA books (and adult books!) had more of them. I'm kinda bummed by that. To me the illustrations were such an important and powerful part of the story. But I suppose if it gets a few more people to read it I'm ok with that too. I'm an adult who reads graphic novels, so I also am biased. I have the old version of A Monster Calls (with the illustrations) and was fine with it. I've heard a number of adults claim that comics "are for kids." Yet you wouldn't hand a kid the Watchmen graphic novel, would you? It's pretty adult. But maybe some adults wouldn't read it, thinking it's "for kids" since it has illustrations. If the original book had of been shelved in the general fiction of the store rather than being labelled as YA would more adults have been interested? While the new cover is pretty, I don't think it really reflects the contents of the book in the same way as the original cover, and that for me is the judge of whether it is a good cover or not.